Be the first to share your favorite memory, photo or story of Billy . This memorial page is dedicated for family, friends and future generations to celebrate the life of their loved one. 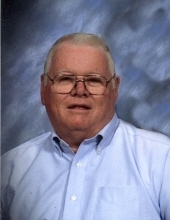 Mr. Billy Sherwood Lee, 80, of Dunn, died Tuesday, January 29, 2019 at his home. Mr. Lee was born August 21, 1938 in Harnett County to the late Emuel S. & Pauline Dorman Lee. Mr. Lee was preceded in death by his brother, George Lee, and his son-in-law, Harris Royal. Mr. Lee was a 1957 graduate of Dunn High School and a member of Mingo Baptist Church. Mr. Lee worked in retail produce from age 16 until his retirement at age 62. He was known for his hard work ethic. Mr. Lee loved his family, especially his daughter Sherrye, and grandsons Patrick and Jackson. A funeral service will be held at 2:00 p.m., Friday, February 1, 2019 at Mingo Baptist Church with Rev. Louis Strickland officiating. Burial will follow in the church cemetery. Mr. Lee is survived by his wife of 56 years, Pat Lee of the home, daughter, Sherrye Royal of Dunn, sister, Carolyn Lee Jackson & husband Ronnie of Clinton; grandsons, Patrick Royal and Jackson Royal; sister-in-law, Linda Lee of Dunn; niece, Leanne J. Camp and husband Dan; and nephews, Scott Jackson and wife Monica, and Daren Lee; four great nieces. Visitation will be at 1:00 p.m., one hour prior to the service at Mingo Baptist Church. Flowers are welcome; however memorials may be made to Mingo Baptist Church, 1465 Mingo Church Rd., Dunn, NC 28334. Arrangements are by Skinner & Smith Funeral Home of Dunn. To send flowers or a remembrance gift to the family of Billy Sherwood Lee, please visit our Tribute Store. "Email Address" would like to share the life celebration of Billy Sherwood Lee. Click on the "link" to go to share a favorite memory or leave a condolence message for the family.